Do You love cooking with Your Instant Pot Mini Duo 3-quart electric pressure cooker or just thinking about getting one? Would you like to cook easy and delicious meals in practically no time? Then this Instant Pot mini cookbook will be perfect for You! Limited-time offer! Buy Paperback at the discounted price of only $7.99 and get Kindle version FOR FREE! 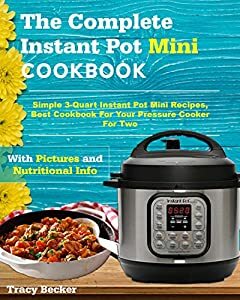 In this Instant Pot mini healthy cookbook, You will find electric power pressure cooker recipes that are delicious, healthy and easy to cook at the same time! All recipes can be cooked with commonly used ingredients. Every recipe comes with detailed instructions how to slice and mix, exact measurements, cooking time and temperature, nutritional information (macros), as well as pictures of what Your dishes will look like! On top of that, You will also get useful Instant Pot mini tips. Millions of people around the world are already enjoying cooking with Instant Pot mini. Be one of them! Do not lose Your chance and buy Your copy with the best Instant Pot mini recipes today for a limited-time price of only $0.99!